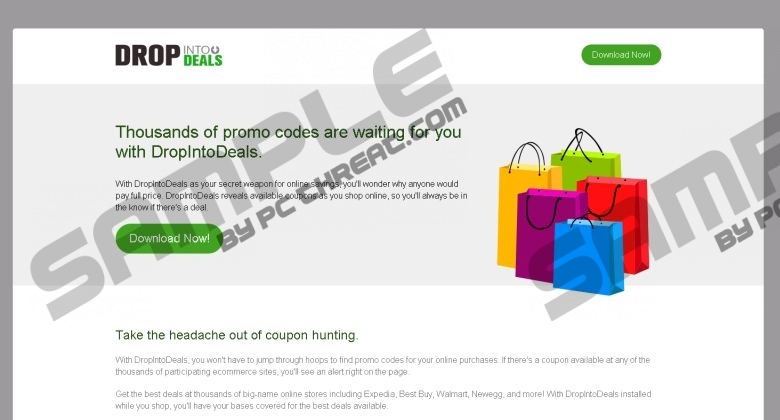 DropIntoDeals is a program which we do not recommend keeping on the system. There is one main reason for that - it is known to be an advertising-supported application. If you do not know how adware works, you should know that they only generates commercial advertisements. DropIntoDeals is no exception, but it still tries to trick users into downloading it. In order to do that, this program says that it can help you to save money at different online stores, including Expedia, Walmart, Best Buy, Newegg, and others. It is not worth expecting that this program will do that because it has not been published to serve the users. Do you really want to keep useless programs installed on your system? If not, you can delete DropIntoDeals rather easily. If you read through this article, you will definitely know how to do that. If you do not want to see pop-ups, coupons, shopping suggestions, video-targeted ads, and other deals on your screen day after day, you should delete DropIntoDeals as soon as you can. Of course, the first reason why you should do that is that it shows irritating commercials. Another reason why you should eliminate this program without further consideration is the fact that its ads can cause serious harm to your system. These ads will not do anything bad to you unless you click on them; however, you should not forget that it is possible to click on ads while browsing the web too, i.e. accidentally. We really want to protect you from malicious software, so we suggest erasing DropIntoDeals. Unfortunately, it does not mean that your system is clean after you uninstall this adware program. Therefore, we recommend scanning the system with an antimalware scanner. You should be especially careful in the future in order not to install programs similar to DropIntoDeals. Specialists have found out that this adware has replaced Sliding-Coupons, DealCoaster, Price-Slicer, Price-Hipo, and Price-Horse, which means that you should not install any of them on your PC. Unfortunately, they travel bundled with untrustworthy software in most cases, so you might install any of these programs without even knowing that. If you do not want this to happen, but do not think that you can protect the system yourself, you should install a trustworthy security tool on your computer. If you cannot decide which tool to install, you should invest in SpyHunter. It will definitely help you to prevent malicious software from slithering onto your computer. Luckily, it seems that it is not difficult to erase DropIntoDeals from the system because this program can be removed via Control Panel. If you do not have time for the manual removal of this program, you should know that you can use an automatic scanner. You just have to acquire it, install it, and scan your system with it. Security specialists working at pcthreat.com recommend using automatic tools because they eliminate all the existing infections and they protect the system 24/7. In other words, they will remove all the existing infections and they will block the entrance of trojans, rootkits, and other serious threats that might try to enter your system. Find the undesirable program and click Remove. Click on the Windows icon and select Control Panel. Tap the Windows key + I and select Control Panel. Tap the Windows + X simultaneously and open Programs and Features. Select the program that you wish to uninstall. Quick & tested solution for DropIntoDeals removal.